Although it is a documentary about the 1960s, don’t expect to see hippies and Woodstock in Grin without a Cat. Those tired American stereotypes play no part in Chris Marker’s four-hour, three-ring-circus of a film. The main attraction in Grin without a Cat is Paris in May of 1968... which was a sort of a French Woodstock in that it’s a watershed event by which all others are judged. Student demonstrators took to the streets and battled with police and a general strike almost toppled the government. Marker is an accomplished filmmaker... he directed La Jetée (1962, the inspiration for12 Monkeys), Sans Soleil (1983) and the Akira Kurosawa documentary AK (1985). In the 1960s he was making Left-looking documentaries on politics in France and Europe and of course filming on the streets during May ‘68. Crowded onto the same stage of Grin without a Cat are Russian tanks in Prague, Che Guevara in South America, the American War in Viet Nam and Chairman Mao’s Red Guards in China. The common thread connecting all of them was the sudden appearance of a new international Leftist movement hell bent on confronting the conservative “Establishment”... whoever that might be. All art is propaganda and Grin without a Cat cleverly begins with overlapping scenes from Battleship Potemkin and the student demonstrations in France. Marker says the students were using the 1925 Eisenstin film as their role model for a romanticized revolution. The students saw themselves as true revolutionaries: not the co-opted Communists of the post Stalin age. They called themselves Trotskyites or Maoists or the New Left and they pitted themselves against not only the Gaullist government but the established French Communist Party as well. 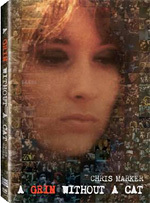 The film is one long montage of images and impressions from around the years 1967 to 1973. Unless you are really up on your history, most of it will be a jumble of people marching in the streets and cops cracking heads. Occasionally I would see a scene I recognized ... National Guard troops marching across the lawn at Kent State, Ohio, and the effect on me was electrifying. To a French audience familiar with the history, the film as a whole must be quite a ride. Grin without a Cat comes in two parts. “Fragile Hands” is taken from a May 16, 1968, student banner reading “The workers will take the flag of struggle from the fragile hands of the students.” “Severed Hands” considers among other things the failed attempts to compromise in the reform governments of Chile and Czechoslovakia. The first part is the romantic Leftist student notion of a revolution and the second is the heartbreaking betrayals and failures of revolution in the real world. This will probably confuse an American audience whose repressed understanding of history can allow the names ‘socialist’ and ‘fascist’ to be equated without a blush. I was surprised to learn that Marker was a member of the Maquis, the French guerrilla resistance of WWII, so he knows his fascists. However, a history of French Leftist infighting makes Grin without a Cat about as relevant as a snowball in Hell for the average American... which says as much about Hell as it does about the snowball. Grin without a Cat is seen from an after-the-fact point of view in 1977, (and then again in a re-edit in 1993 and this re-re-edit of 2008). This is interesting for me because 1977 is also the year that Star Wars was released. That’s the film that made war safe for the cinema again and was the first glimmer of the Reagan era in the US. One person’s morning is another’s sunset and Grin without a Cat ‘s sad heart is in 1977 looking back on the follies and broken promises of failed revolutions and with a good idea of what is to come. Today this makes Grin without a Cat a timely corrective to the Right’s sanctioned politically correct history of the last 30 years and it is I think a fair telling of what it was like to have been there. The 1960’s may seem like a time long long ago and in a galaxy far far away, but as space is curved, you will eventually come back to the point where you started from. The stock market has crashed, laissez-faire capitalism is in retreat and even Christopher Hitchson reports in the April 2009 Atlantic that Marx is back and “the times (may) turn dialectic again.” This is going to come as bad news for those people subscribing to the notion that history is over. Grin without a Cat is a hard slog the first time through, but I’ve watched it twice and could watch it again. Is it a historical curiosity, or a shape of things to come? We will just have to wait and see. There is one; a 16 page booklet containing a 2008 essay (The Sixties) by Chris Marker, a set of reference notes by Marker, and a useful 2002 review by Phil Hall. This is a chaotic film which is appropriate for depicting a chaotic time. It’s hard to watch and hard to understand what is said. Fortunately there are subtitles though, not on the English voiceover. No one has gotten the sense of the 1960s’ lost dreams better than Hunter Thompson in his ‘Wave’s Crest’ sketch from Fear and Loathing In Los Vegas. It’s about the US but could just as well be about France. Read this before watching Grin without a Cat.